It was never easy, but these days, law enforcement is facing a new kind of challenge that can make their jobs even harder - stopping the spread of rumors and fake news. NPR's David Schaper reports that firefighters in California's wine country recently got embroiled in a battle over fake news, even as they were still trying to extinguish those devastating wildfires that killed 42 people. DAVID SCHAPER, BYLINE: In the midst of a recent news briefing to update efforts to contain more than 15 raging wildfires, various evacuation orders and the number of people reported missing, Sonoma County Sheriff Rob Giordano had to change the subject. SCHAPER: Giordano explained that a couple of days earlier, his officers had arrested a homeless man for starting a small fire in a local park where he was known to sleep in order to keep warm. 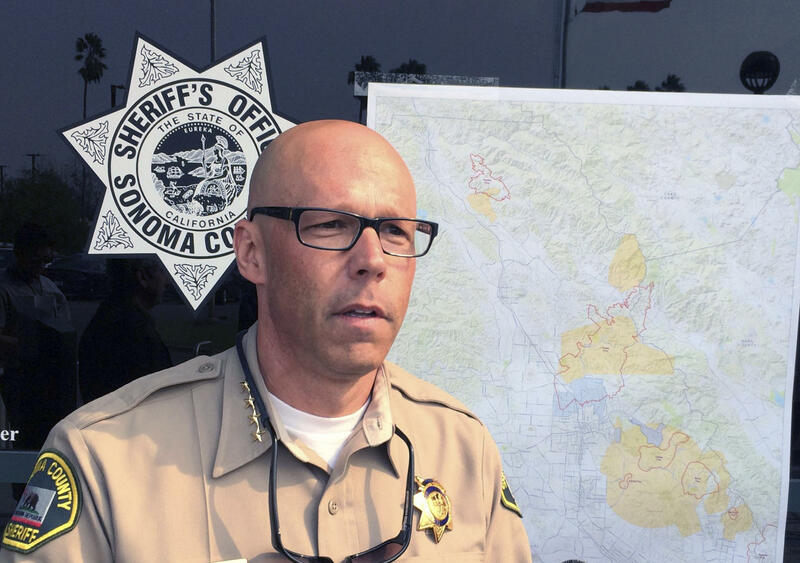 GIORDANO: ...The story out there is he's the arsonist for these fires. That is not the case. There's no indication he is related to these fires at all. GIORDANO: The erroneous story came from Breitbart News, the right-wing website run by President Trump's former political strategist, Steve Bannon. The article claimed an undocumented immigrant had been, quote, "arrested for suspicion of arson in wine country fires that have killed at least 40 residents." That, Sheriff Giordano said, simply wasn't true. GIORDANO: I just wanted to kill that speculation right now so we didn't have things running too far out of control. SCHAPER: But even though it was shot down by the sheriff, debunked by fact-checking organizations and Breitbart added a clarification, the original story did spin out of control. One version of the false narrative was shared on Facebook 75,000 times, and that doesn't even include the number of times the story was tweeted out or shared elsewhere. It's an example of how false information is being spread through big social media platforms. And it raises questions about whether companies such as Facebook and Twitter are doing enough to stop it. Because even as the wildfires still raged, the false stories ignited a squabble. The Trump administration's top immigration official criticized the sheriff's office for leaving the community vulnerable to dangerous individuals, leading Giordano to call those statements inaccurate and inflammatory. This isn't the only time in recent weeks that law enforcement authorities have had to spend time and resources during a crisis to try to stop rumors and misinformation. In Houston, after Hurricane Harvey, phony news photographs proliferated on social media, supposedly showing the airport under water. 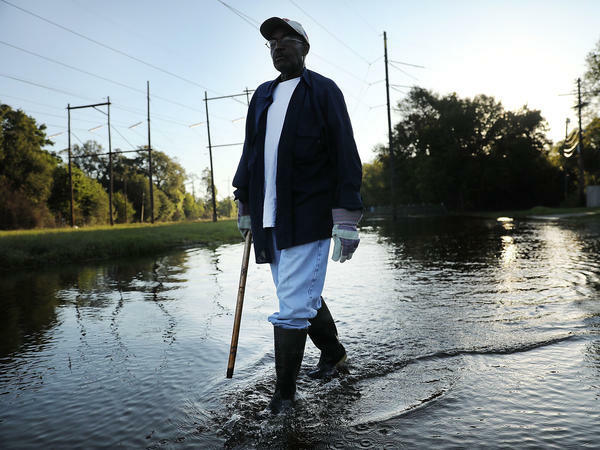 And authorities also had to quell false rumors that levees had burst and that a dam had failed. And in Clark County, Nev., after the Las Vegas massacre, Sheriff Joe Lombardo angrily addressed virally spreading conspiracy theories, including one about a second shooter. JOE LOMBARDO: There is no conspiracy. Nobody is attempting to hide anything in reference to this investigation. SCHAPER: With the advent of social media allowing people to tweet out rumors, fact or to deliberately spread false information to promote a political point of view, law enforcement officials across the country increasingly find themselves in need of truth squads. SCHAPER: Sandra Hutchens is sheriff of Orange County, Calif., and president of the Major County Sheriffs of America. HUTCHENS: ...That just communicate with the public and try and get that information out there to counter a lot of the negative, and, in some cases, false news that's out there. SCHAPER: It is resource-intensive at a time when budgets are tight. But Hutchens says law enforcement authorities need a strong social media presence of their own to quell misinformation that could put residents in danger. She acknowledges, though, that some people still believe a false narrative instead of the facts. HUTCHENS: You know, the political tempo is so high right now. And I think that, then, people are just not listening to what the truth is. SCHAPER: To some degree, that is what the creators and spreaders of false content intend. They use automated systems to search for misleading articles and misinformation that reinforce certain points of view and then promote them in the social media feeds of people who are inclined to believe and share them. Indiana University journalism professor Elaine Monaghan says Facebook, Twitter and other social media platforms need to do a better job policing misinformation. ELAINE MONAGHAN: Too much news is being caddied there that it's incumbent on these organizations that are making money from news to act responsibly in the dissemination of it. SCHAPER: It's likely that some members of Congress will ask that of Google, Facebook and Twitter when executives from those tech companies appear at hearings on Capitol Hill this week. David Schaper, NPR News. Transcript provided by NPR, Copyright NPR.